Sometimes "aha" moments come in the most random of places. On Wednesday, I did a Q&A panel with two other local bloggers at the local library. One of the other panelists, who blogs at MPBStrong.com, was this incredibly inspiring woman who survived a ruptured brain aneurysm a couple years ago and now blogs about her recovery. One of the questions we were asked is how to keep up motivation to blog on days we just didn't feel like it. I answered something about accepting the fact that there's always unfun things that go along with the fun things. Since my blog is a big part of my business, I've just gotta push through! But Mary Pat said mater of factly, "If I'm not inspired, I don't write." Lately, I haven't felt super inspired. A lot of my posts have been a product of me just pushing through. Between writing for the blog, writing for brands and writing emails, at least half of my day is writing, often more. Creatively, it can get a bit exhausting! After a good conversation with my RD friends earlier this month, I realized that what's been dragging me down is this pressure to create "sharable" content. Growing my blog is important for business - it introduces me to potential new clients, both in my private practice and food/wellness brands to collaborate with. But at the same time, growth has been kinda stagnant, as it's been for a lot of us in the blogging world. I’ve been thinking about how I want to change this blog to bring back the joy to blogging while still making it useful for you lovely readers, and I’ve decided that it’s going to be a little more lifestyle focused. I’m going to continue sharing recipes and Wellness Wednesday posts, but my content will be a more focused on sharing bits about my life and my job. Part of the reason is because it’s easy – I don’t have to come up with a story when the story is already written. But the other part is I want to give you a glimpse into what a “healthy” lifestyle looks like. There’s this idea that living a healthy lifestyle is all about daily workouts and green juices and cooking every meal at home, but that’s absolutely not the case. Life is messy, and I’m cool with sharing some of that mess if it helps you lovely readers feel more at home with your own mess. Anyway, while we’re on the topic of mess, I’m finishing this post up super early in the morning. I completely screwed up the date for one of my articles for Earth Fare this week. Apparently, writing dates in your calendar while drinking wine in France doesn’t work so well. So, I ended up having to fit another article into an already busy week. Now my whole schedule for the week is off and I had to actually drag myself out of bed when the alarm went off so I could hopefully get this post out before my morning client who will be here shortly! Ack! First, cook the farro. Bring farro and 2 cups water to a boil in a small pot. Cover and reduce heat to medium low and simmer 30 minutes until tender. Pour off any extra water and place farro in the refrigerator to cool while preparing other ingredients. In a blender, combine all dressing ingredients and blend until creamy and arials are broken down. 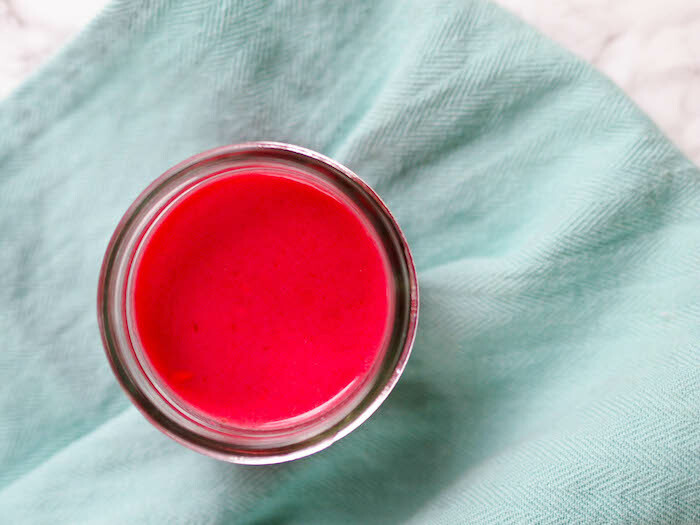 If you have a high powered blender, the seeds will blend right in but if your blender is a regular one, you may need to run the dressing through a strainer. 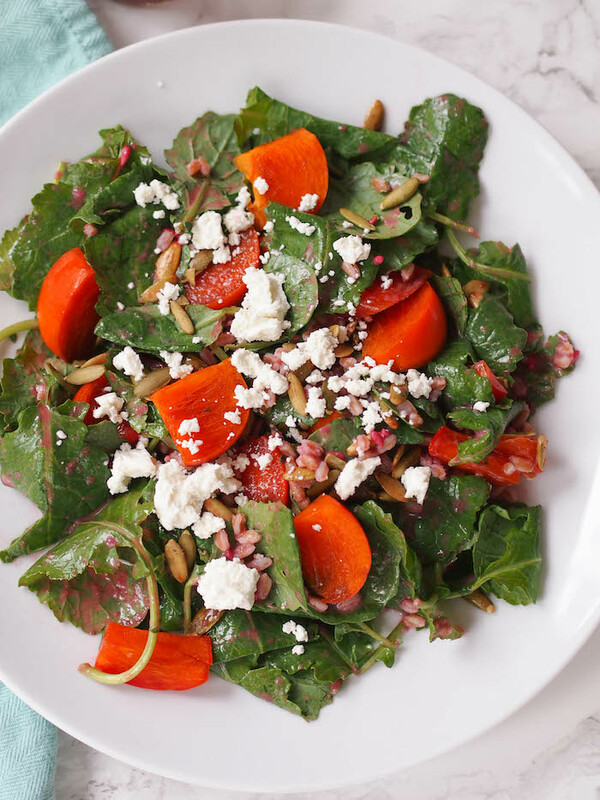 In a large bowl, combine baby kale, sliced persimmons, pumpkin seeds and goat cheese. Top with cooled farro. 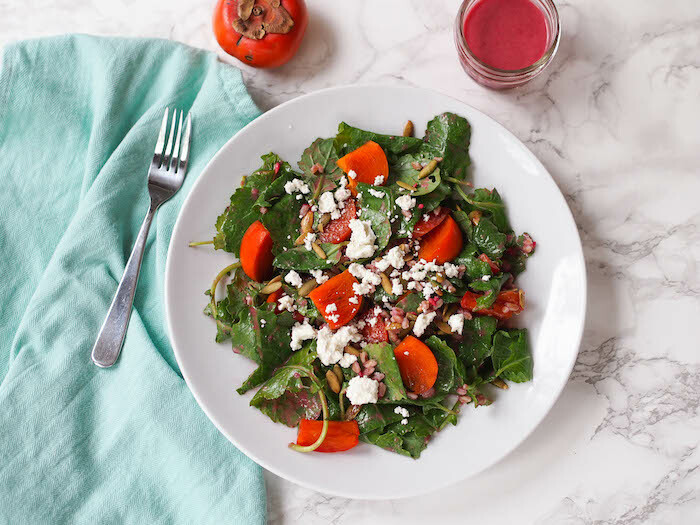 Drizzle with pomegranate dressing, toss and serve.